(Hong Kong, 14 September 2018) – FRANCIS, Wan Chai’s hot foodie hangout now brings a different spin and a popular way of dining on Sundays, offering a new take on the traditional Middle Eastern skewers. 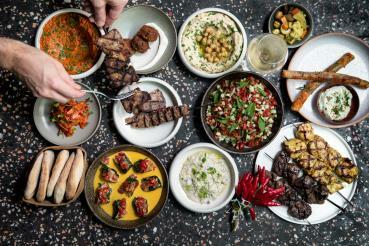 Inspired by the bustling shipudim restaurants of Tel Aviv where diners feast on grilled meat skewers alongside small, tasty sides and homemade breads, Chef Asher Goldstein showcases the new Skew-It menu of four skewers (choice of two), and ten flavorful meze dishes all for just HK$360 per person. The menu is best to be enjoyed by a group of 2-6 people. Skew it Sundays will be held on the last Sunday of every month, and the occasional public holiday, with the first on 30th September (Sunday), available from noon until 10.30pm at the lively spot that takes its food and wine seriously - all at an honest price. The menu comprises of four generously-sized skewers of baharat-spiced chicken thigh, Wagyu rump beef, succulent Iberico pork and lamb kafta (one of the most popular dishes). Guests can choose two skewers per person and enjoy 10 meze dishes to share. The choice of flavorful homemade meze - for which FRANCIS is famed - includes Baba Ganoush (eggplant and tahini), Muhammara (hot pepper and walnut), Dolma (silverbeet, rice and preserved lemon), Chopped Israeli Salad (with tomato, cucumber and parsley) and marinated Feta Cheese with spiced beans. All made with the freshest ingredients daily.